Are Veterans Being Given Deadly Cocktails to Treat PTSD? A potentially deadly drug manufactured by pharmaceutical giant AstraZeneca has been linked to the deaths of soldiers returning from war. Yet the FDA continues to approve it. Sgt. Eric Layne’s death was not pretty. A few months after being prescribed a drug cocktail with the antidepressant Paxil, the mood stabilizer Klonopin and AstraZeneca’s controversial antipsychotic drug, Seroquel, the Iraq war veteran was “suffering from incontinence, severe depression [and] continuous headaches,” according to his widow, Janette Layne, at FDA hearings for new Seroquel approvals last year. Soon he had tremors. ” … [H]is breathing was labored [and] he had developed sleep apnea,” said Janette Layne, who served in the National Guard during Operation Iraqi Freedom along with her husband. On the last day of his life, she testified, Eric stayed in the bathroom nearly all night battling acute urinary retention. He died while his family slept. Sgt. Layne was not the first healthy veteran to die after being prescribed medical cocktails, including Seroquel, for PTSD. In the last two years, Pfc. Derek Johnson, 22, of Hurricane, West Virginia; Cpl. Andrew White, 23, of Cross Lanes, West Virginia; Cpl. Chad Oligschlaeger, 21, of Roundrock, Texas; Cpl. Nicholas Endicott, 24, of Pecks Mill, West Virginia; and Spc. Ken Jacobs, 21, of Walworth, New York have all died suddenly while taking Seroquel cocktails. Since the 2008 publication of “The Battle Within,” the Denver Post‘s expose of a “pharmaco-battlefield” in Iraq, in which troops were found to be routinely propped up on antidepressants, the Department of Defense has sought to curb the deployment of troops with mental health problems to combat zones. The DOD has also stepped up monitoring of soldiers who have been medicated, according to the Hartford Courant. Thirty-four percent of the 935 active-duty soldiers who made suicide attempts in 2007 were on psychoactive drugs. It would be hard to find a drug with a wider fraud footprint than Seroquel — at least one that’s still on the market. One of its first backers, Richard Borison, former chief of psychiatry at the Charlie Norwood VA Medical Center, lost his medical license, was fined $4.26 million and went to prison for a swindle involving Seroquel’s original clinical studies. AstraZeneca’s U.S medical director for Seroquel, Dr. Wayne MacFadden, had sexual affairs with two different women doing research on Seroquel, a study investigator at London’s Institute of Psychiatry and a Seroquel ghostwriter at the marketing firm, Parexel. According to court documents, MacFadden even joked about the conflicts of interest with one paramour. Last year, the Chicago Tribune and ProPublica reported that Chicago psychiatrist, Michael Reinstein, who wrote 41,000 prescriptions for Seroquel, received $500,000 from AstraZeneca. Meanwhile, a report in the Minneapolis Star Tribune discredited influential studies by AstraZeneca-funded Charles Schulz, MD, chief of psychiatry at the University of Minnesota. Seroquel was even promoted by the disgraced former chief of psychiatry at Emory University School of Medicine, Charles Nemeroff, who was accused by congressional investigators of failing to report $1 million in pharmacological income — in AstraZeneca-funded continuing medical education courses. And until a Philadelphia Inquirer expose last year, Florida child psychiatrist, Jorge Armenteros, a paid AstraZeneca speaker, was chairman of the FDA Psychopharmacologic Drugs Advisory Committee responsible for recommending Seroquel approvals. Oops! The trial of Vietnam veteran, Ted Baker, who claims Seroquel he was prescribed for PTSD caused diabetes which began last month in New Jersey, is one of 26,000 lawsuits AstraZeneca faces. Yet, instead of reconsidering a drug linked to deaths and tainted by at least eight corruption scandals in 13 years — Seroquel was even prescribed to a 4-year-old Massachusetts girl, Rebecca Riley, before her death — the FDA continues to wave through new approved uses for Seroquel. Seroquel (quetiapine) was first approved to treat schizophrenia in 1997. The FDA subsequently expanded its use, approving it for “acute manic episodes associated with Bipolar I Disorder” in 2004, “major depressive episodes associated with Bipolar Disorder” in 2006 and “maintenance treatment for Bipolar I Disorder” in 2009. Not that Seroquel needed a boost; its $4.9 billion in sales in 2009 signals usage far beyond the 1 percent of the population with schizophrenia and the 2.5 percent with bipolar disorder. North Carolina’s Medicaid spends $29.4 million per year on Seroquel — more than on any other drug, according to the Charlotte News and Observer. Most recently, in December, while the nation was watching the health reform bill, Seroquel was quietly approved for children between the ages of 10 and 17 who are diagnosed with bipolar mania and children between 13 and 17 with schizophrenia. The stealth decision was not announced by the FDA itself but by AstraZeneca and appears as a footnote on Seroquel’s FDA approval page saying “Patient Population Altered.” Quite an alteration. Stan and Shirley White lost two sons to war. Robert White, a staff sergeant, was killed in Afghanistan in 2005, when his Humvee was hit by a rocket-propelled grenade. But the death of Robert’s younger brother Andrew, who survived Iraq only to succumb to a different battle, is in some ways “harder to accept” says his father. “When six people die from peanut butter we shut the factories down, but at least 87 military men have died in the past six years on Seroquel and similar drugs and no alarm sounds,” Stan White says. When White informed his representatives, Sen. Jay Rockefeller and Rep. Shelley Moore Capito of West Virginia, of Andrew’s unexplained death, they were helpful, as was Tammy Duckworth, the VA’s Assistant Secretary of Public and Intergovernmental Affairs. But packets White distributed to news organizations, Congress and the White House were acknowledged only by First Lady Michelle Obama, who forwarded hers to the VA, and Sen. Daniel Akaka of Hawaii, who chairs the Senate Committee on Veterans Affairs. In letters to White, both remarked that therapy, not just drugs, should be part of PTSD treatment. “The direct impact of non-prescribed medications in these patient deaths cannot be determined,” investigators concluded. SSgt (Ret) Tom Vande Burgt’s Army National Guard company was stationed outside Baghdad at the same time that Eric and Janette Layne were serving, in 2004 and 2005, but his story has a happier ending. Under the care of a private psychiatrist, Vande Burgt’s cocktail only grew, but eventually he went off the drugs with the help of his doctor, and his sleep apnea, urinary problems, tremors, weight gain, depression, mood swings, lethargy and paranoia subsided. Seroquel “drugs vets up” to such a degree that they “don’t dream at all,” says Vande Burgt in an email. It removes the “hypervigilance factor but as soon as the meds are decreased, the hypervigilance and anger and trust issues come raging back, worse than before,” he says. Now the Vande Burgts, who live in Charleston, West Virginia, coordinate a PTSD support group and a Web site, that emphasize non-drug solutions and the need for soldiers and veterans to have an advocate present during care for PTSD and traumatic brain injury to ensure clear communication between doctors and patient. Tom also uses the services of Give an Hour, a program in which local therapists donate one hour of therapy a week to veterans, soldiers and families dealing with PTSD. “The second-generation antipsychotics were termed ‘atypical’ based on misconceptions of enhanced safety and efficacy,” Dr. Grace Jackson, a former Navy and Veterans Administration psychiatrist and author of Drug-Induced Dementia and Rethinking Psychiatric Drugs, said in an interview. Seroquel’s record of causing sudden cardiac death was even on the docket at last year’s FDA hearings, which Stan and Shirley White and Janette Layne attended. Ray, professor of preventive medicine at Vanderbilt University School of Medicine, published the findings in an article titled “Atypical antipsychotic drugs and the risk of sudden cardiac death,” in the New England Journal of Medicine last year. When committee members asked Ray how AstraZeneca’s own studies, presented earlier at the hearings, could show no risk — like the White/Layne VA Inspector General report — he said the drug company data were skewed by “Simpson’s paradox,” the same statistical manipulations that made Vioxx look safe. But unwilling to let Seroquel’s approval prospects sink just because it’s dangerous, the FDA’s Marc Stone, a medical reviewer, donned his AstraZeneca hat at the hearing in a presentation rebutting Ray’s testimony. 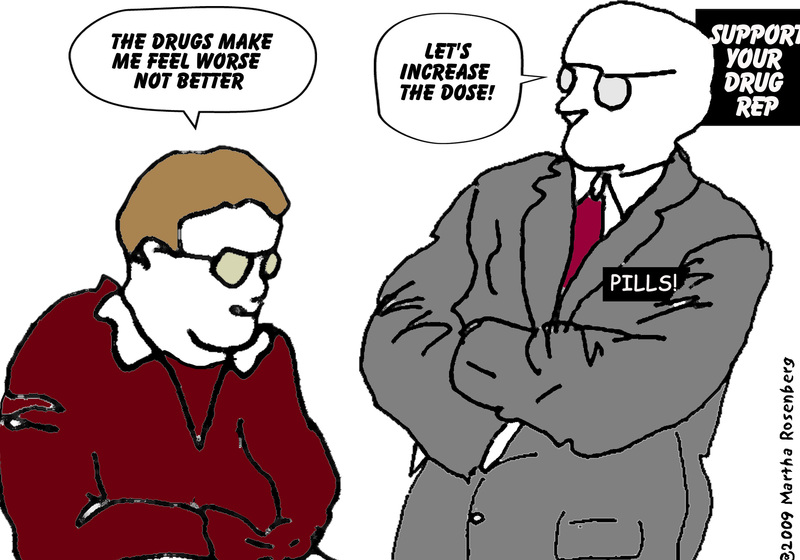 He also pointed out that “Mental illness severe enough to require antipsychotic drugs … may also increase the chances of someone being homeless or living alone with little social contact,” apparently forgetting that the purpose of the FDA hearings was to approve Seroquel for non-mentally ill people with anxiety and depression. 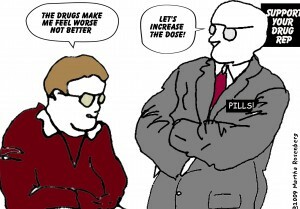 “These data are encouraging for adjunctive treatment with a second-generation [atypical] antipsychotic in patients who have partially responded to an SSRI or an SNRI [antidepressants],” says the American Psychiatric Association’s March 2009 Practice Guideline for the Treatment of Patients with Acute Stress Disorder and Post-traumatic Stress Disorder. Matthew J. Friedman, one of its four authors, is executive director of the U.S. Department of Veterans Affairs National Center for PTSD — and an AstraZeneca consultant. “Quetiapine improves sleep disturbances in combat veterans with PTSD,” wrote Mark Hamner in a 2005 Journal of Clinical Psychopharmacology article. Hamner is medical director of the PTSD clinical team at the Ralph H. Johnson Department of Veterans Affairs Medical Center in Charleston, SC — and an AstraZeneca consultant. “Atypical antipsychotics also have an emerging place in PTSD pharmacology, particularly for symptoms of paranoia, intense hypervigilance, arousal, extreme agitation, dissociation, psychotic-type flashbacks, and brief psychotic reactions,” writes Cynthia M. A. Geppert in a 2009 Psychiatric Times article. She is chief of consultation psychiatry and ethics at the New Mexico Veterans Affairs Health Care System — and recipient of three AstraZeneca grants. Meanwhile, critics and activists ask: What protections are afforded to veterans enrolled in Seroquel studies — some combining Seroquel with other drugs — that AstraZeneca-funded doctors conduct at VA medical centers? Many say that Big Pharma, embedded in academic institutions, medical schools, military medicine, government entitlement programs and the FDA, itself, is too big to regulate, like Wall Street firms. But others say the incarceration of VA Chief of Psychiatry, Richard Borison in 1998, is proof the system works. The original version of this story appeared on Alternet. This article was posted on Thursday, April 15th, 2010 at 8:59am and is filed under Health/Medical, Psychology/Psychiatry, United Kingdom.